The Cuvée Brut Bellavista expresses a synthesis of the deepest values of its terroir, drawing from a selection of 30 wines from vineyards in the Franciacorta area. The frankly astonishing flavours and fragrances present in this label derive from the presence of various reserve wines in the selection, which endow it with finesse and charisma. 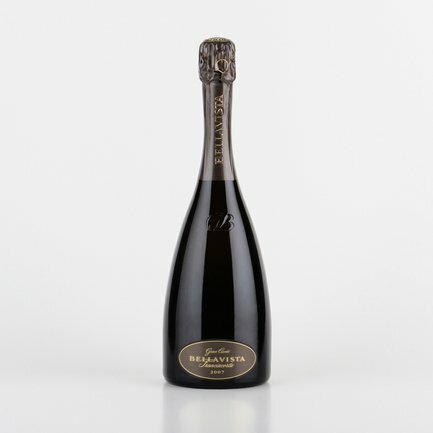 Made from 80% Chardonnay and 20% Pinot Nero and Pinot Bianco, the Franciacorta Cuvée Brut Bellavista has a persistent froth and an impressively fine perlage. It displays a green-tinted yellow hue and conjures up fragrances of white flowers, ripe fruit and vanilla. Elegant and superbly balanced, a wine for great for occasions. The inimitable wines produced under the Bellavista label start life on history-soaked Lombardy hillsides looking out towards Lake Iseo, the Po Valley and the Alpine peaks. Here, since 1976, expert craftsmanship, respect for age-old vine-growing and wine-making principles, plus a passion for perfection, have united to exploit an extraordinary terroir to the full. Elegance, stylishness and personality: these are the dominant traits of the wines produced by Vittorio Moretti, who pursues quality in every phase of the productive process, through continuous research, wine culture and learning. This is the vision behind the creation of Bellavista wines. Their unique sensorial qualities provide tangible proof of a gifted wine-maker's passion for fine wine.